Moon Shadow does not know what to think when he is told that he is going to have to leave his home in the Middle Kingdom to join his father in the Land of the Golden Mountain – America. He will have to live among the demons with a father he has never known, and who knows when he will see his mother again, but Moon Shadow knows he must go and so he does. When he gets to San Francisco, it is strange to meet the tall man who is his father and to find out that he is now known as Windrider. Moon Shadow meets the Company, a group of Tang men who together own and manage a laundry in the Tang people’s town, or as the demons called it, Chinatown. It is comforting to be in the Tang people’s town for Moon Shadow feels uncomfortable and afraid around the demons – the white Americans. He knows that many of them hate his people and he has heard how some of them have hurt or even killed Tang people just because they are different. All goes well enough for Moon Shadow until his father gets involved in a fight because of cousin Black Dog. Black Dog is addicted to opium and he will do anything to get the terrible drug; he will even beat up and rob Moon Shadow. Windrider will not tolerate this and he and Black Dog get into a fight. A man ends up dead and Windrider and Moon Shadow have to leave the Tang people’s town. They end up working for, and becoming friends with, a demon woman and her niece. Miss Whitlaw is kind and generous to the father and son, and the four of them form a close bond which only becomes closer when a terrible earthquake hits in the early hours of the morning on April 18th, 1906. Losing everything convinces Windrider that the time has come for him to pursue his dreams. For years he has dreamed of building a flying machine. He has worked on many model gliders, and he has even written to the famous Wright brothers for advice. Maybe the earthquake was a message to him that he should no longer put off his dream. So, with Moon Shadow by his side, and despite the disapproval of friends and relatives, he leaves the city, moves into a barn, and sets about trying to fulfill his destiny. Without a doubt Laurence Yep is a master storyteller who creates fascinating tales packed with unforgettable characters. This beautifully written book paints a fascinating portrait of life in the San Francisco area in the early 1900’s. Readers who have an interest in learning about America’s immigrant history will find this book to be truly captivating. Thanks to certain movies and books we have a very inaccurate picture of what it was like to be a Chinese person living in America in the past. 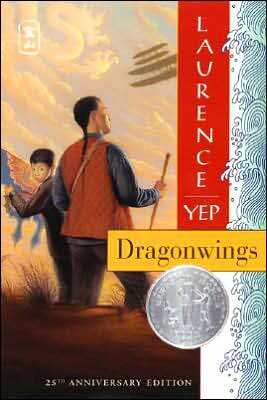 Laurence Yep's books help to correct our misconceptions, and to understand what it was really like to be a Chinese immigrant living in a Chinese community on the west coast of the United States in the early 1900's.